This year for the lent season, I decided to spend more time in prayer and personal study with God. I admit that I've allowed life and social media (help me Lord) to get in the way of my priorities. Since I started my weight loss journey in 2014, I've learned that consistency is key. Anything, and I mean anything can throw you off course...only if you let it. The second half of 2014 was a bit tough for me. 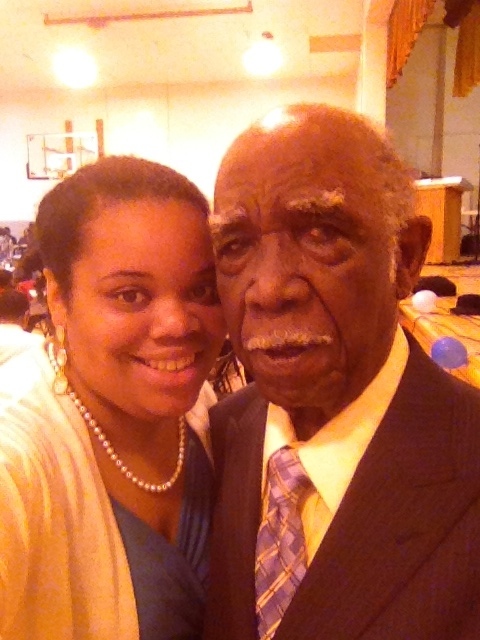 Losing my grandfather hit me hard and I had to readjust to life without Gramps here on earth. I stopped working out, my eating fell completely off and my weight went up and down. I know my body very well, and I can always feel when I'm gaining weight. I knew that 2015 had to be better for me. I can't have a great quality of life if my relationship with God and my health aren't in order. It's easier for me to make drastic challenges, so, I challenged myself to workout for 40 days straight while increasing my prayer and study time with God. Along with that, I've decided not to eat out, unless it's my last resort. I've already eaten out 2 days, but that's better than 3-4 times a week. Yep, it seems like a lot, but I get the best results when I make drastic changes and goals that sometimes seem unrealistic. Oh, but this goal is reachable. I'm on day 18 and I feel pretty good. I love prayer and quiet time everyday, and my body thoroughly enjoys working out. Day 2 of my 40 day workout challenge. Excuse my room! I was purging! 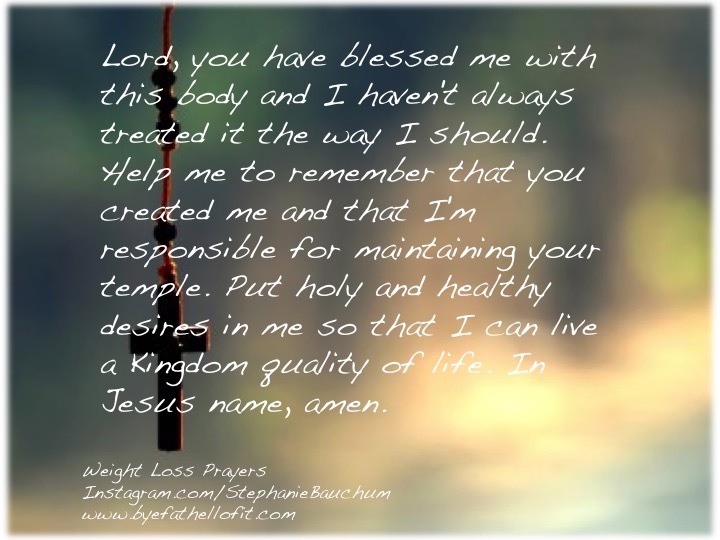 During my quiet time, I started writing prayers for weight loss and healthy living. Prayer is the foundation of everything that I do, however action is definitely required on my end for weight loss. One morning I prayed, "Lord, you have blessed me with this body and I haven't always treated it the way I should. Help me to remember that you created me and that I'm responsible for maintaining your temple. Put holy and healthy desires in me so that I can live a Kingdom quality of life. In Jesus name, amen." Whew, that's powerful! A Kingdom quality of life! That's the life that I'm going for and I'm already experiencing it. Miracles have taken place. Business is growing and I can hear God through the clutter that sometimes clogs my spiritual ears. I've got 22 days left and I can't wait to share my results, not only physically, but also spiritually. If you're wanting to change your life and feel as though you're out of touch with God and your health, I invite you to join in with me. If you can't commit to 40 days of working out (yea that's a lot...I know) at least commit to prayer and study time with God. It'll change your life, your mind and eventually everything else will fall into place. Stay tuned for my results! I love that you are strengthening your faith while strengthening your body. Prayer is powerful and with the help of the Holy Spirit you can reach your goal. Lent is a wonderful time to draw near to God and to see how you're incorporating your two goals is truly inspirational. God Bless You! I love that you chose a Lenten goal that is positive and not just "give up" something! I especially love that your focus is on growing closer in your relationship with God. I'll be anxious to see what bonus results you see after the 40 days! Sorry for your loss of your grandpa. I miss mine yet & it's been many years ago! Good for you in fighting back to get fit. I have to do the same. Setbacks don't have to be permanent — just temporary. A 40-day faith & fitness goal sounds so smart! Keep it up! This is awesome! I'm a spiritual/religious person, not perfectly but trying to be better. I have never even thought to pray for help with weight loss and that that would bring me to a new spiritual level as well. I really love this idea and I can't wait to see your results - in all aspects! You go girl!! (Sometimes I think I'm cool enough to say certain phrases - my 5 year old sets me straight real quick though). I'm sorry for your loss of your grandfather. I wish you the best in your weight loss journey! Sounds like you are very determined. Looking forward to checking back to see how your 40 day challenge goes. I bet you will do great! I love your determination and it sounds like you have your priorities in order! I pray you'll be blessed through this season. Also, I checked out you food link and it looks really good! I'll be back for those recipes! You have taken responsibility for your body and want to treat it right. Keep up the good work. I think that writing is also a positive practice that can help you fulfill your goals. It is amazing that you are challenging yourself to improve both your body and your mind. One has to be in harmony with the other, I believe this is the only way to set yourself up for success. With the help of a beautiful prayer that you wrote, I can see you easily completing the challenge! So many times we set about doing something and think we can do it in our own strength only to fail or become discouraged. I think you have hit the mark when you realize you need to hand over your weight loss to the Lord & concentrate on the desire to be fit and healthy as a reflection of the body He has blessed you with! I can't wait to see how He blesses your efforts and answers your prayers! That is really beautiful and definitely something that I need more of in my life. This really struck a chord with me. I need to make some huge changes and this is the kick in the paints that I needed. Love this. I know people often talk about their body is a temple, but they don't treat it with respect when it comes to food. Prayer will open up clarity and light and make it easier to be healthy. God bless. Beautiful message and a very nice blog. Good Luck in 2015 and on your weight loss journey. There are days when it is very hard (I know) but God will always see us through. Have a Fabulous Day!! I have really been thinking about how I take care of myself lately. I want to do better, so I have made that a priority for this year. I haven't done very good so far, but this article was a good reminder for me. I especially needed the part about things throwing you off course only if you let it. The choice is mine. Thanks. This prayer is powerful and focusing. Thank you for the direction. I love the idea of a 40 day challenge! I've put on a little weight in the last 6 months that I'd like to lose - that would give me a great way to get started. Good luck on your journey! What a beautiful prayer! I know I take this body for granted many times, and don't treat it as I know I should be. Thank you for sharing your journey with us. It is such an encouragement! You are awesome! And that prayer is powerful and applicable to us all. I know I don't always make holy and healthy choices when it comes to food. Thanks for the challenge! Keep up the great work. May God bless you on this journey! Great job! I love the idea of combining the spiritual discipline with the physical discipline. It takes faith to make big changes in your life. You're on the right track! I understand that struggle too well myself. God bless you! Way to go! You have made such a huge decision and with such prayer. God will bless you for your effort and intent. Any time we put Him first and foremost, He does great and wonderful things. I love your workout prayer and can't wait to see your accomplishments!! Keep up the good work! I feel like in my life combining exercise with some other commitment (for me it's a mile-a-day streak) keeps me more motivated. Can't wait to see your results! Great job and good for you for working on yourself and working towards your goals! I will definitely be following your blog to see your progress and success! Keep us posted! I love the challenge that you have given yourself! It really is great that you are combining your physical goals with your spiritual goals! You seem like a very beautiful person inside and out! I send my condolences on the loss of your grandfather. I will be praying that you can find some peace and joy in life even without him here. I know the pain of grief all too well. I used to wonder how I would handle it when I lose my grandma who I am very close to but then I lost my dad instead. Losing a loved one is one of the worst things in this world and I think all that we can do to get through it is to pray! Good luck with your challenge and I can't wait to check back when it is finished and see how well you did! I love how you are combining your weight loss goal with your faith. I would not think to pray in this way. Great post! And I mean this in the kindest way, your font is a bit hard for me to read. Smiles! Very powerful post! I admire your commitment and wish you the very best of luck on your journey. Although with daily prayer, you don't need luck. Stay focused and enjoy each day! Can't wait to hear about your results! Good for you! I am also more focused on growing in my relationship with The Lord this year, and losing weight, but I had put those in 2 different categories. I love how you have combined them! You're right, God gave me this body. I should ask Him for wisdom and motivation in maintaining it. Weight loss is one of my biggest concerns and also one of the biggest challenges of my life. It is extremely difficult and requires the power of mind, body, spirit balance to move us along the path to weight loss success. Prayer and self-connection is an integral part of achieving our goals. Thank you for sharing your self with us and your inspiring weight loss prayer. I appreciate it. That's a wonderful way to motivate yourself, but creating weight loss prayers. I commend you for your goals and wish you the best as you strive for a healthy body and a peaceful soul. I love the praye rStephanie! I also need to focus on getting fit both physically and spiritually. Good for you for making the commitment to yourself that you have!!!! God bless! This is awesome. I can honestly say that when I added morning bible study to my life about 3 years ago. My entire life changed. My days began to have meaning and purpose. Congrats to you. I wish you the best of luck in your weight loss journey. Thanks for sharing. We're a prayerful family - and yet, I have never really prayed for guidance in keeping my physical health up. And ironically, that's an area in my life that I need the most work on, and yet ignore the most. Thanks for an inspiring post!